Light: Speaking your mind. Making your opinions known. Offering constructive criticism. Sharing your knowledge. Making insightful observations. Pinpointing the problem. Clarifying what others have said. Giving clear direction to others. Uncovering the truth. Shadow: Stating your opinions as fact. Picking fights. Starting arguments. Using clever insults to undermine the confidence of others. Tossing reason out the window. Speaking without taking the feelings of others into account. Going on a witch hunt. Distorting evidence. Personality: The Knight of Swords can represent anyone who wants to lead the way (Knight) to greater knowledge and mental clarity (Swords). The Knight may also represent the tendency to be more intellectual than empathetic, or a compulsive desire to analyze or lecture others. Story: The Main Character’s remarkable abilities cause some to become his enemies. Relationships. Words can hurt. In addition to knowing why you’re saying what you’re saying, think about how you’re saying it. Don’t read too much into the statements of others. If you aren’t sure what someone means, ask for clarification. Resolve to be a better listener. Work. Ask good questions. Before rendering judgment, be sure you have all the facts. Refrain from cutting others short; even if you’ve heard it all before, give others a chance to share their ideas. Resist the urge to correct; open the door to free-wheeling creativity before you become an editor. Spirituality. Consider the words that have been used to shape your understanding of yourself (and Spirit) over the years. If these terms have been poisoned by dogmatism and abusive spirituality, strive to find your own words for the higher powers and deeper realms you hope to explore. Personal Growth. Rather than be defensive, relax. Give criticism a chance. A mature person acknowledges his or her capacity for improvement, and isn’t intimidated by the observations of others. Take what will help you; discard the rest. Fortune Telling. A blunder leads someone to say something he or she regrets. If this was you, be prepared to apologize and move on. When? Between January 10th and February 8th. The Upraised Sword. Charge! 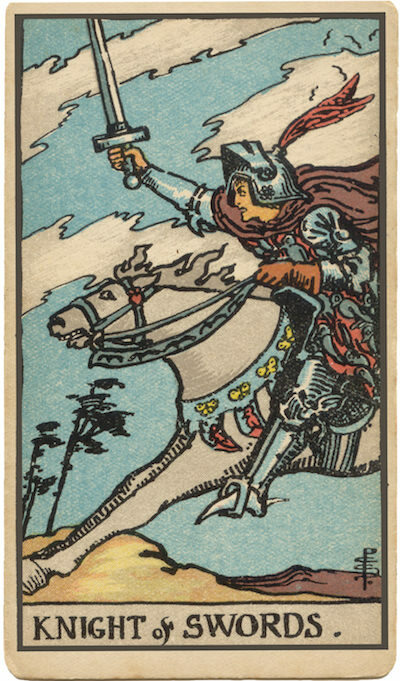 In many different decks, the Knight of Swords is rushing off on a quest, sword upraised. But what is the quest? What’s his destination? What are the terms of success? Charging ahead feels great—but before you do it, a little investigation and reflection can go a long way. Information vs. Insight. The Knight of Swords is associated with information and investigation; be sure to pair this rush to research with intuition and a desire for insight! Expertise. Expertise can speed an investigation, allowing us to identify issues others would overlook. Who’s the expert on your challenge? How can you encourage him or her to work with you? The Marseilles Image. The Marseilles Knight of Swords is, perhaps, the most confident of his counterparts. His prancing horse and battle-ready posture exude a level of competence other Marseilles characters seem to lack. How does information impart confidence? How might getting more information help you be more confident now? To what extent have I investigated the facts behind my situation? How can I share what I know without alienating others?